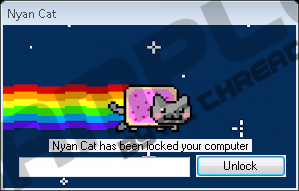 The appearance of Nyan Cat Screenlocker might make you smile for a second until you realize it is a work of a malicious program. Our researchers have classified the application as a Trojan, so it may enter the system uninvited. The strange part is that the malware does not do anything much besides crashing the system. For example, it could encrypt user’s data and demand to pay a ransom or use other ways in attempts to extort money. Either the threat is not yet finished, and its creators could be still testing it, or it was developed for no other reason than to crash users’ computers. In any case, it might pose a threat to your system, and it would be best to get rid of Nyan Cat Screenlocker as soon as possible. To make the task easier, our specialists prepared removal instructions that you may find at the end of this page. Currently, it is unknown how the malicious application could be distributed, but our researchers say there might be a couple of possible methods. Firstly, Nyan Cat Screenlocker could be spread with suspicious email attachments, for example, executable files sent by someone the user is not familiar with. Then, the malware might be distributed through malicious web pages. For instance, such sites could offer you to install some updates and trick you into launching the Trojan. Therefore, to avoid threats alike you should not open suspicious executable files, especially if they come from unreliable file-sharing websites or Spam emails. For example, if you need any updates just go to the software’s official website or wait till the program itself suggests you upgrade it. The same applies to applications you would like to acquire as their installers should be downloaded from legitimate sources. Of course, it is not easy to identify malicious content or avoid each single threat, and that is why we advise you to think about antimalware software. A reliable tool could help you guard the system against malware all the time. It might be used at times when users need to check suspicious data before launching it too, so the tool could be useful in various situations. However, if you carelessly launch the executable file carrying Nyan Cat Screenlocker, the Trojan should immediately crash the explorer.exe. Then lock the screen and display a message with a picture of Nyan Cat. The message says “Nyan Cat has been locked your computer.” A little below there is an empty box, most likely provided to insert a password. Next to it users should see a button called “Unlock.” Once it is clicked the malicious program should show you a warning saying the password is wrong. Usually, such infections tell user’s to contact developers through email and then with the reply letter they ask to pay a fine or ransom. Since the Trojan’s creators do not provide any contact information it is hard to say how you are supposed to get the right password or what is the purpose of locking the screen. Fortunately, if you do not have the patience to enter numerous variations until you get the correct password, there are other ways to unlock the screen and get rid of the malicious application. Our specialists noticed that Nyan Cat Screenlocker does not block the Task Manager. Thus users can launch the tool and use it to kill the malicious program’s process. Afterward, the screen should be unlocked, and then users can choose between two options to eliminate the threat. The first one is to erase the malware manually as it is shown in the deletion instructions located below. The other one is to download a trustworthy antimalware tool and leave the removal part to it. If there are any other questions about this Trojan, you could try to contact us via social media or leave a comment below the article. Select processes tab and search for a suspicious process (the title could be random). Select the Trojan’s process and press End Task. Check your Desktop, Downloads, Temporary Files, or other folders where the malicious executable file could have been downloaded to. Find a suspicious executable file you had launched before Nyan Cat Screenlocker locked the screen. Select this file, right-click it and press Delete. Quick & tested solution for Nyan Cat Screenlocker removal.